Starting from being a laundry soap in 1899, to a toilet soap in 1925, and then to a bath soap that has the finest fragrance of the most exquisite flowers, Lux truly has traveled over a century to attain the excellence that it is now known for. Unilever, the company that developed this brand, has made it within reach of women from all walks of life. 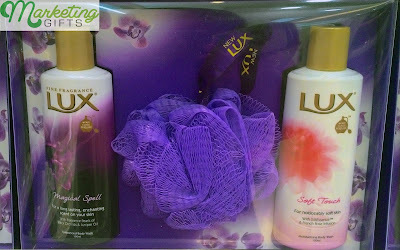 Not to mention, they also give away amazing free products to go with the Lux merchandise. Just like this branded mesh puff. Bigger Income. Branded mesh puff does not come cheap if you buy one separately. Of course, unbranded ones are not advisable, because you can only use them once or twice before you have to replace them again. Therefore, the Lux puff can ensure bigger income for the brand. More Brand Name Recall. It is not difficult to decipher the brand name on the handle of the mesh puff. The gift with purchase will bring more recollection to the brand. Greater Brand Significance. Customers give greater significance to the brand that offers more promotional ideas, that’s why the mesh puff is a plus for Lux. Visit our Marketing Gifts blog, and contact us to find more ways to promote your business.